Breaking the tradition of sequels, Pixar returns with an original in the winning “Coco.” While 2014’s Guillermo del Toro-produced animated effort “The Book of Life” highlighted Mexican culture first, director Lee Unkrich (2010’s “Toy Story 3”) and screenwriters Adrian Molina (who receives a co-directing credit) and Matthew Aldrich come up with their own rich, personal story that is at once culturally reverent and thematically universal. Celebrating the importance of family is a common throughline in many Disney pictures, and themes of believing oneself and seizing the moment may seem theoretically basic for a film targeted at children, but the filmmakers also have something to say about memory, regrets, family ties and mortality. 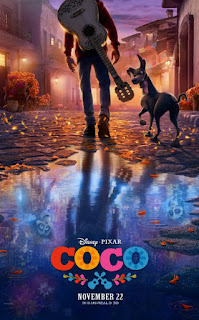 Top-notch in the animation department, full of imagination, color and detail, and the amount of pathos the story conjures up, “Coco” is a joy. Growing up with a family of shoemakers and shoeshiners in Mexico, 12-year-old Miguel Rivera (voice of Anthony Gonzalez) has always loved music. Though pressured by his abuelita (Renée Victor) to follow in his family’s footsteps, he aspires to be like his late idol, Ernesto de la Cruz (Benjamin Bratt), a movie star and “the greatest musician of all time” who was crushed by a bell, but there’s one rub. Ever since his great-great-grandfather abandoned his wife and daughter, the Rivera family sees music as a family curse and bans Miguel from strumming a guitar in front of them. On Día de los Muertos (the Day of the Dead), where photos are placed at an altar so those who have left the Land of the Living can cross over and see their loved ones for the holiday, Miguel sneaks into the tomb of the legendary Ernesto de la Cruz and gets transported to the Land of the Dead. He’s visible to all of his skeleton ancestors, who are excited to see him but must get him back home. His great-great-grandmother, Mamá Imelda (Alanna Ubach), will grant Miguel her blessing to return him home if he promises to never pursue a career in music, but if he does not exit the afterlife before sunrise, he could be trapped there forever. When Miguel evades them with his street-dog companion Dante, he meets gangly con artist Héctor (Gael García Bernal), who agrees to help Miguel find the long-passed Ernesto de La Cruz if he puts up Hector’s photo up in the Land of the Living so he can see his family before he’s forgotten forever. Nobly expanding an audience’s worldview with Mexico’s cultural tradition that comes with a dose of the macabre, “Coco” is simply enchanting. Named after the eldest living member in the Rivera family—Miguel’s great-grandmother, Mamá Coco (Ana Ofelia Murguía), whose memory is fading fast—the film makes it a vital lesson in Miguel’s life-or-death quest to honor and remember deceased family members even if they are no longer with us. Such a delicate idea sounds like it would be heavy, but how director Lee Unkrich and screenwriters Adrian Molina and Matthew Aldrich integrate what’s underneath Miguel’s lively adventure into the Land of the Dead is handled with wisdom, good humor and hard-earned emotions through its distinct, engaging characters. 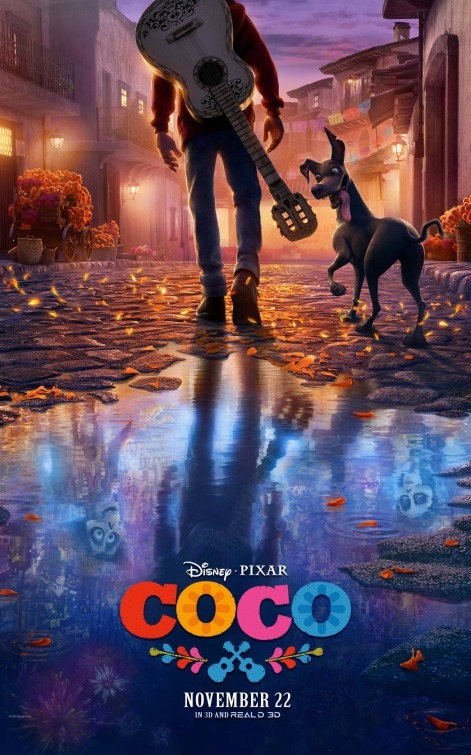 As thoughtfully written as it is rousing and dazzling to look at, “Coco” is an inventive, touching and flavorful treasure that delivers on every level. It is often very funny with no less than two laugh-out-loud gags with Frida Kahlo's edgy art pieces and a lot of playful humor involving skeletons and their body parts. The script also very carefully unpacks a family history and revelations that are surprising and gutsy for an animated film as the story comes to a head at Ernesto de la Cruz's concert "Sunrise Spectacular," where Mamá Imelda finally gets her chance to share her voice with the world. The fact that the cast is filled with fewer A-listers than usual makes the story that more emotionally immersive, led by endearing newcomer Anthony Gonzalez who makes for a charming, plucky young protagonist. 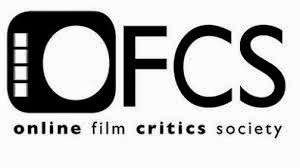 A visual treat of bright animation, the film is wondrously, painstakingly designed from its opening of cut-tissue-paper streamers to its festive and vibrant presentation of the Land of the Dead, a metropolis of floating towers, and its flower bridge that allows the dead to cross over during Día de los Muertos. 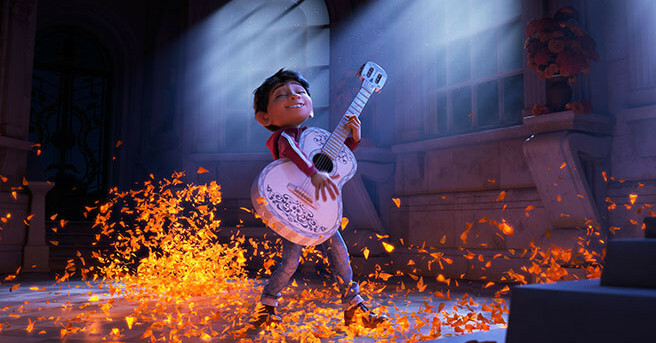 In a story about the love of music, the songs, written by Germaine Franco, Adrian Molina, and married “Frozen” team Robert Lopez and Kristen Anderson-Lopez, are exuberantly performed, including a duet of “Un Poco Loco” between Miguel and Héctor played at a talent show in the Land of the Dead and the lovely “Remember Me” with Miguel and Mamá Coco. All that has gone before the film’s last five minutes won’t prepare one for the beautifully moving, smiling-through-tears final moments, making “Coco” pretty perfecto.